to your Wallet Balance and set up Low Balance alerts, so that you’ll always have money in your Wallet Balance when you need it. 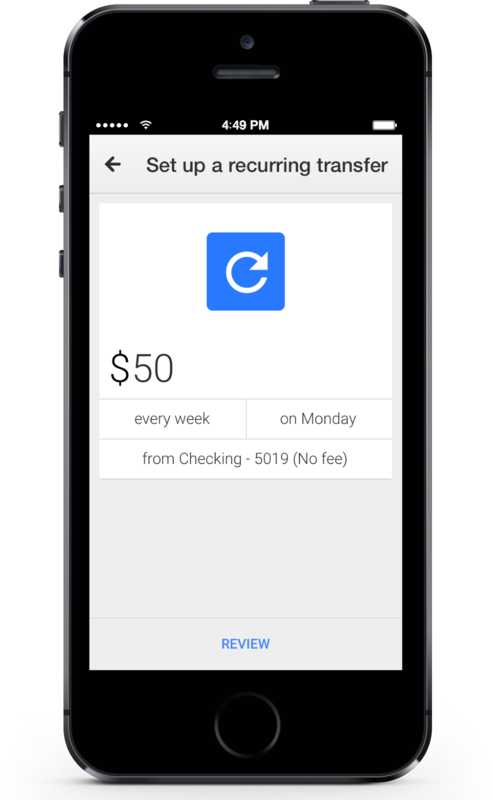 Today, we are announcing a new way to add money to your Wallet Balance automatically through recurring bank transfers. The feature is secure, and will give you fast access to your money, with no Google Wallet fees. With recurring bank transfers, adding money to your Wallet Balance takes care of itself. Simply schedule a recurring transfer from your bank account right into your Wallet Balance, and never worry about adding money to your Wallet Balance again. Choose the amount, set a schedule (weekly, bi-weekly or monthly) and you’re all set. Money will be added to your Wallet Balance automatically, and you can cancel your transfer at any time. There are no fees or minimum balance requirements for your Wallet Balance. And rest assured, your money is safe. Your Wallet Balance is backed by 24/7 fraud monitoring and the Google Wallet Fraud Protection Guarantee, which covers 100% of any transactions made without your authorization. If your device is lost or stolen, you can easily disable the Google Wallet app online or by contacting Google customer support. With Low Balance alerts, you can keep track of your Wallet Balance and make sure you have enough to pay for the things you need, or to send money to friends and family. Spend your Wallet Balance in stores by swiping your Google Wallet Card at millions of locations in the US (including the District of Columbia) where Debit MasterCard® is accepted*, or use it to withdraw cash from an ATM. You can also use your Wallet Balance to Tap & Pay with any Android device running Kit Kat or higher at hundreds of thousands of locations throughout the US, on any mobile carrier. And as always, you can use it to make online purchases on Google Play, Google Express and anywhere you see the “Buy with Google” button. * The Google Wallet Card is issued by The Bancorp Bank, Member FDIC, pursuant to license by MasterCard International Incorporated. MasterCard is a registered trademark of MasterCard® International Incorporated. See Cardholder Agreement for details. What if you never needed to remember to add money to your Wallet Balance? Now, you don’t. 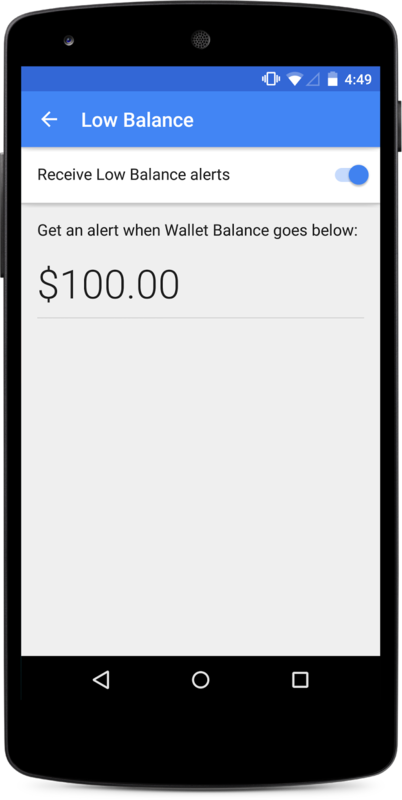 With the latest version of Google Wallet you’ll be able to add money automatically to your Wallet Balance and set up Low Balance alerts, so that you’ll always have money in your Wallet Balance when you need it.